Where there are Hits, there have to be Misses! Thankfully I’ve not had too many catastrophes this year so I’ve ended up with just three contenders. First up: Exhibit A – my Colette Dahlia. It’s probably obvious that I’m a bit of a perfectionist, so the Dahlia debacle was a definite low. Lesson learned – I managed to turn it around and ended up with a dress I could live with. The encouragement I received from you all as a result of my moaning was truly inspiring. Thank you. I put the problems down to not scrutinising my toile closely enough, and for choosing a fabric that wasn’t really suitable. It turned out I wasn’t the only one having serious fit issues. The cherry on the cake was having my salvaged rag appear in the Colette Patterns Dahlia Sewalong Round-Up (thanks to Clarinda Kaleidoscope for spotting it!). They clearly hadn’t read the accompanying post! The next ‘miss’ I am confessing to is my most recent birthday frock, the V1342. Don’t get me wrong, I rose to the challenge and loved the look of it, but the soft viscose hasn’t held it’s shape well. The result is a skin-tight fit around the behind and baggy ruching across the bust – not a good combination. Having worn it just once, it’s already losing its shape. No-one, and I mean NO-ONE wants a droopy bosom! I was never entirely happy with the finish partly due to complexity of pattern, softness of fabric, and general lack of skill on my part. It was made as a birthday one-off, and was a fabulous challenge. But I’m unlikely to wear it again without some serious sewing first aid so I think I will reuse the gorgeous teal fabric for a garment I will get lots of wear out of. My final exhibit is my Colette Beignet denim skirt. There’s nothing technically wrong with this number, I just haven’t worn it. Well, maybe twice! I approached this pattern methodically and carefully, and wanted to use it to develop my skills. I took time to top-stitch seams and chose perfect buttons; I was rather proud of the finished garment. The problem here is that it just does not flatter my shape. Probably my biggest lesson of the year has been to really consider what suits rather than making something I’ve seen someone else look fabulous in online. Father Christmas left me an overlocker under the tree, so next year’s first goal will be to learn how to use it. My other ‘resolution’ will be to slow the pace down a little. 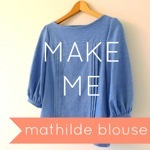 I have loved churning through make after make; it’s addictive and there’s always something exciting that I want to make next. But it’s not sustainable in the long term, and does not match my objective for well thought-out sewing choices as an alternative to impulse-buying on the High Street. It’s my Top 5 of 2014! 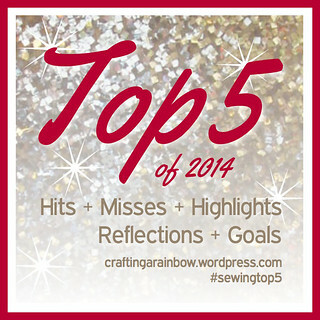 There’s no time like the end of the year for some peaceful reflection/anxious soul-searching, so I was keen to participate in Crafting a Rainbow’s Top 5 of 2014. This year’s been a cracker on the sewing front. After a year of making clothes, I took the plunge in July and decided to stop boring my nearest & dearest with the offspring of my Janome and instead let them run free and wild on the internet. Since then, I’ve grown my little backyard plot of cyberspace into a happy place with some lovely new internet chums. Clockwise from top left, this Tilly & The Buttons Mathilde in chambray was an early make and has been well-loved. It must have been beginners’ luck as my pattern moderations resulted in a slimmer fit and short sleeves with no tears shed. Oh, and did I mention that it appeared on Tilly’s blog?! I’ve made four Colette Moneta dresses, including the polka dot and black ones shown here (the polka dot snap also proves that I do occasionally step away from the fireplace!). There’s something about this pattern which results in a perfect fit and finish every time. It also represents my early foray into sewing with knits. I have worn all four versions as many times as it’s polite to, without people wondering if you ever wash your clothes! That just leaves my Emery in crazy loud £3 fabric, and the Sureau in Liberty Tana Lawn. I spent considerable time getting the fit right on both of these, and it paid off. I have to remind myself of this when I’m in the grip of a sewing frenzy and am desperate to get to the finish line. So it’s a frock-heavy selection. Next year I’ve vowed to make more casual clothes so I can incorporate handmade in my non-work life. I’m already dreaming of a corduroy Grainline Moss skirt, a chambray Archer, a denim-linen Sureau and of course some Ultimate Trousers. After seeing some fabulous Bluegingerdoll Bonnie sweaters by Handmade Jane, Kelly of Make Sew Do, and Marie of A Stitching Odyssey I am lusting after one of my own. So those are the Hits. Next up: The Misses! What were your Hits of 2014?